‘To Space’, ‘In Space’ and ‘From Space’. 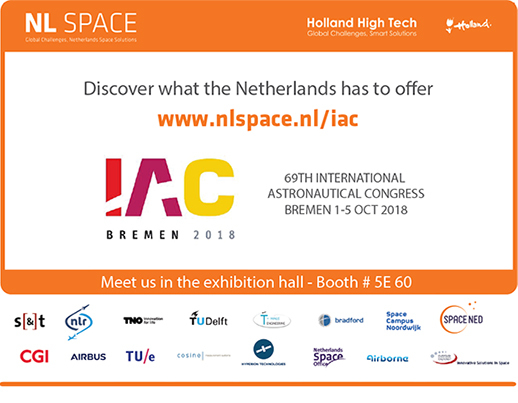 Under these three themes fifteen space companies and institutes from the Netherlands will present their work at the International Astronautic Conference (IAC), which will take place from 1-5 October in the city of Bremen, Germany. Together they plan to build up leads and make deals in the dedicated NL Space pavilion. The IAC is the largest yearly international space conference in the world with an extensive exhibition. Space organisations and industry discuss future projects and show the world the latest space high-tech. The Tropomi instrument, the latest Dutch masterpiece in space can be found in the NL Space Pavilion. Since its launch last year, this earth observation instrument keeps on surprising the world with images of unprecedented detail showing air pollution in every place on earth. But that’s not all. The latest small, smart and compact space instruments will be on display, including small satellites the size of a milk carton. Smaller and smarter are important trends in space, also in the launcher business. Dutch companies will display state of the art high-tech for the development of small launchers.